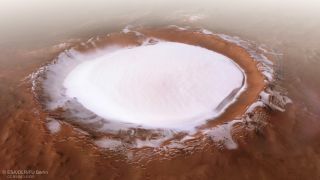 This image from the European Space Agency's Mars Express satellite shows Korolev crater, located near Mars' northern pole. The crater's coordinates are 165 degrees E, 73 degrees N on the martian surface. Images of an "ever-icy" Martian crater reveal a distant yet mesmerizing winter wonderland. What appears to be a bowl of fresh snow in this imagery released by the European Space Agency (ESA) on Thursday (Dec. 20) is actually an ice deposit chilling the air moving over it, agency officials said in a statement. Ice is found in the deepest parts of this formation, called Korolev Crater, and as air moves over the ice, it cools down and sinks, producing cold air right above the chilly deposit. This image from ESA's Mars Express shows Korolev crater, and is composed of five observations, each one from a different orbit of the spacecraft. It's High Resolution Stereo Camera (HRSC) instrument took the data that formed the image. ESA officials called this phenomenon a "cold trap" because the air acts as a shield to keep the crater "permanently icy." Korolev Crater is 82 kilometers across (51 miles) and found just south of terrain that wraps around Olympia Undae, Mars' northern polar cap. The crater floor can reach depths of two kilometers (1.2 miles) below its rim, deeper than Earth's Grand Canyon. This image shows the landscape in and around Korolev crater, a feature 82 kilometers across (51 miles) found on Mars' northern lowlands. The bold white box indicates the region that the Mars Express High Resolution Stereo Camera imaged over orbits 18042, 5726, 5692, 5654, and 1412. The elevation of the terrain is denoted by the blue colors indicated by the bar at the bottom. The High Resolution Stereo Camera on the space agency's Mars Express satellite captured five different "strips" of the crater, each one coming from a different orbit of the spacecraft. By combining them, a single image was produced. Mars Express has a connection with Christmas — the mission first fired its main engine to enter into Martian orbit on Dec. 25, 2003, after a roughly six-month journey from Earth. Mars Express is the agency's first spacecraft to explore another planet, but its high-resolution stereoscopic camera and mineralogical mapping spectrometer originated with an earlier mission called Mars 96, which failed shortly after launch on Nov. 16, 1996.